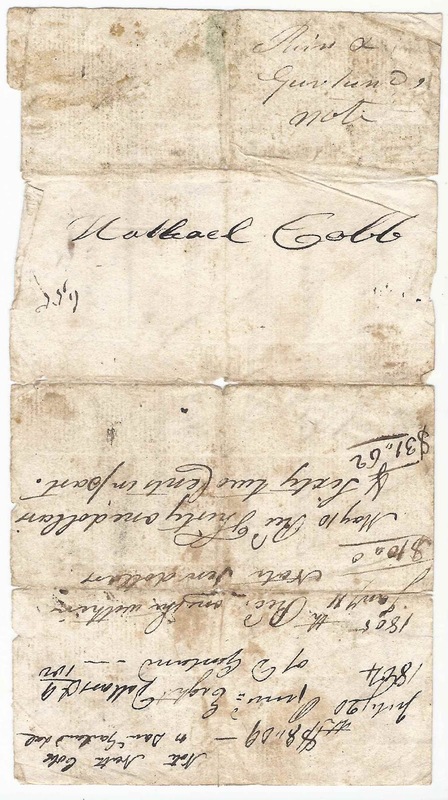 Promise to Pay dated November 28, 1803 at Portland, Maine. 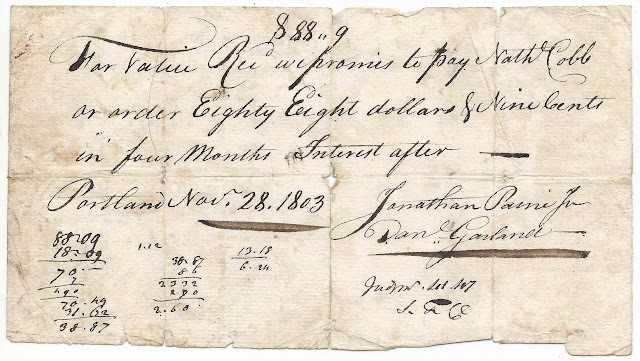 Promise to Pay Nathaniel Cobb $88.09, signed by Jonathan Paine, Jr., for Daniel Garland. The reverse shows dates that payments were received. For value Rec. 88.09 we promise to pay Nathanial Cobb on order Eighty Eight dollars & Nine Cents in four Months, Interest after. Portland, Maine, Nov. 28, 1803. The bottom front and reverse top half detail load payments. 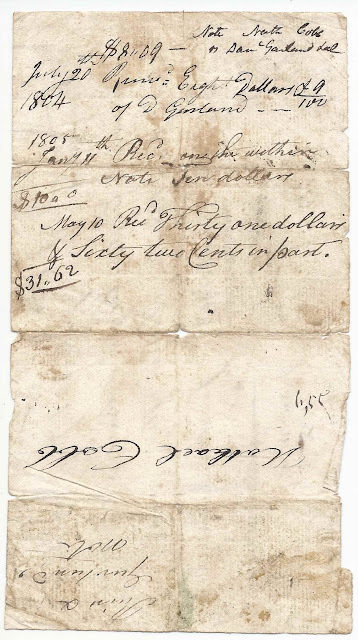 It seems to have taken until 1805 or beyond for the load to be paid in full. Nathanial Cobb may have been the Rev. Nathaniel Cobb (1783-1873). He married twice: 1) Anna Mitchel; 2) Betsey Poole. A History of the Cobb Family, by Philip Lothrop Cobb, published in 1907. Jonathan Paine, Jr., may have been the Jonathan Paine, Jr. (1772-1823) who married Aphia Richards in 1821. Jonathan died in 1823 at the age of fifty-one and is buried in Eastern Cemetery in Portland, Maine, with Aphia, who died in 1850. Daniel Garland may have been the Daniel Garland who was married to Phebe H. (Paine) Garland, presumably related to Jonathan Paine. Daniel and Phoebe are buried in the Eastern Cemetery in Portland, Maine. If you have information on Nathaniel Cobb, Jonathan Paine, Jr., and/or Daniel Garland, please leave a comment or contact me directly. Thanks!